5g tablets - 50 Pack. 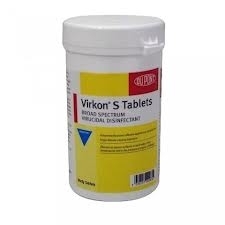 Virkon S is a broad spectrum disinfectant that has been tested and proven effective against all known viral families and also kills bacteria and fungi. Virkon S was designed for use by farmers. It can be safely used around animals and their surroundings.